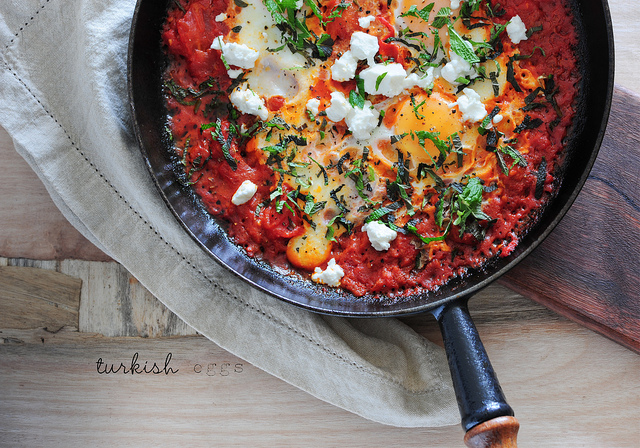 These Turkish style baked eggs are perfect for family dinners, served with a light green salad or are an impressive addition to any weekend brunch. Preheat oven to 160°C fan-forced. Heat oil in a medium frying pan over medium-high heat. Add onion. Cook stirring, for 5 minutes or until softened. Add paprika, coriander and cumin; cook, stirring, for 1 minute or until fragrant. Add tomato and 1/2 cup of water. Season. Bring to a simmer. Wrap pita bread in foil and place in oven. Cook for 5 minutes or until warm. Make 4 holes in tomato mixture and crack 1 egg into each hole. Reduce heat to medium-low, cook covered for 5 minutes or until egg white is set and yolks are still runny. Top with crumbled feta and chopped mint. Serve with tzatziki, hummus and pita bread. Anytime! I thought yours looked pretty delish too!